In China, applied geochemistry research is focusing on geochemical exploration, regional geochemical mapping, global geochemical baselines, and environmental geochemical survey. Geochemical exploration continues to be the strongest in the field of applied geochemistry in China. Most of funds for applied geochemistry research from the government and companies are allocated to regional- and local-scale geochemical surveys/exploration for mineral resources. A small amount of funds is allocated to global-scale geochemistry and environmental geochemistry projects. Some large or nation-wide applied geochemistry research projects in China are introduced as follows. The China Geochemical Baselines Project (CGB), as a part of Global Geochemical Baselines (Darnley et al., 1995), was initiated in 2008 and was planned to be completed in 2013 (Wang Xueqiu, 2012). The purpose is to document the abundance and spatial distribution of chemical elements across the whole China. The database and accompanying element distribution maps represent a present geochemical baseline against which can be quantified future chemical changes and past chemical evolutions. Approx. 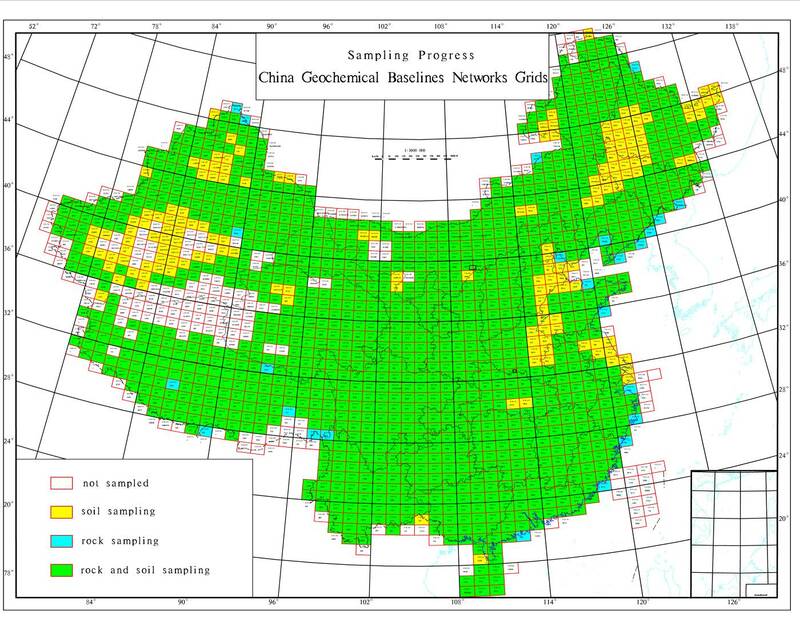 1500 grids of China Geochemical Baselines Networks were designed to cover the whole China's land (9.6 million km2). Each grid is 1°(lng.) ´40¢(lat.) (approx. 80km´80km) (Fig. 1). Soil (overbank/floodplain/catchment sediments) samples and rock samples were collected. At each soil sampling site, two samples are taken from surface horizon (0-25 cm) and deep horizon (>100 cm or C horizon). Typical rock samples, representing different geological times, are simultaneously collected in order to interpret the geogenic sources of soil geochemical patterns and to understand the chemical evolution during the past geological time from Archaeozoic to Quaternary. Approximately 18 000 rock samples and 6 000 soil samples have been collected until 2012. 81 geochemical parameters including 78 chemical elements are determined by ICP-MS/AES following 4-acid digestion and XRF following fusion as backbone methods combined with other 10 methods. Analytical quality is under strict control by using standard reference samples to obtain harmonious high-quality data. A Internet-based software named Digital Chemical Earth was developed for managing the database and maps, and allow people to access vast amounts of geochemical data and maps through the Internet. The data show greatly intersting results for understanding the past geological events dispalyed by rock samples and for quantifing the chemical changes displayed by soil samples. For example, Iridium anomalies were discovered in the Cretaceous and Tertiary (K-T) boundary in Yunnan, southwestern China, where the Lufengosaurus fossils were located. The concentrations of Ir range from 0.2-0.8 ppb, average value is 0.41 ppb in the boundary tufaceous limestone and tufaceous claystone, whereas Ir concentrations in Cretaceous sandstone and Tertiary mudstone are less than 0.02 ppb (Wang, 2012). It may imply that Iridium in the boundary is extraterrestrial origin, providing us with understanding dinosaurs extinctions due to the impact of an earth-crossing asteroid (Alvarez et al., 1980). Soil geochemical baselines can be quantified the chemical changes. For example, dramatic changes of CaO concentrations and distribution deminsion were quantified in the past 15 years by comparing sampling in 1994 and 2009 in southern China. Floodplain sediments or catchment overbank sediments have been collected by the Environmental Geochemical Monitoring Network Projec (EGMON) in 1994 (Xie and Cheng, 2001) and by the China Geochemnical Baselines in 1999 (Wang, 2012). The average concentration decreases from 0.53% to 0.41%, distribition area of concentrations <1% CaO extends from 872 000km2 to 1073 000km2, increasing 23% compared to that in 1994, due to leaching of CaCO3 by acid rains influenced by human activities in southern China (Wang, 2012). Increase of acid rain precipitatio are mainly due to coal, oil and gas burning, because the duration of the past 15 years is the fastest increase phase of industralization and urbanization in the history. We could predict or quantify future changes by using the present geochemical baselines. The Regional Geochemistry- National Reconnaissance Project (RGNR) mainly using stream sediment sampling has covered all the hilly and mountainous regions in China approx. 6 million km2, where the stream sediment samples are available since 1978 (Xie, 1997). The project has made great contributions to mineral discoveries in China. However, the sampling methods continue to be refined for the remaining regions including basins, desert, elion and grassland terrains, where stream sediments are not available. Recently, the good research progress is that development of effective sampling methods for the north and northwestern China Gobi desert, desert basins, and semi-desert grassland landscapes. Sampling of catchment basin sediments in semi-desert terrains and fine fraction of regolith samples (-120 mesh) from the weakly cemented clay-rich horizon at a depth of 10-40cm in desert terrains are effective for delineation of regional targets. Geochemical survey at a density of one sample per 100 km2 in an area of approximately 150 000 km2 in southern Xinjiang desert has delineated regional targets of Au, Cu, Pb, Zn and U from 1999-2002 (Wang et al., 2007). Some large ore deposits have been discovered by follow-up exploration at the targets. The developed sampling method is being applied in China-Mongolia Boundary Geochemical Mapping Project at a scale of 1:1,000,000 since 2006. 10532 samples have been collected across the boundary area of approximately 1 million km2 at a sample density of 1 per 100 km2. 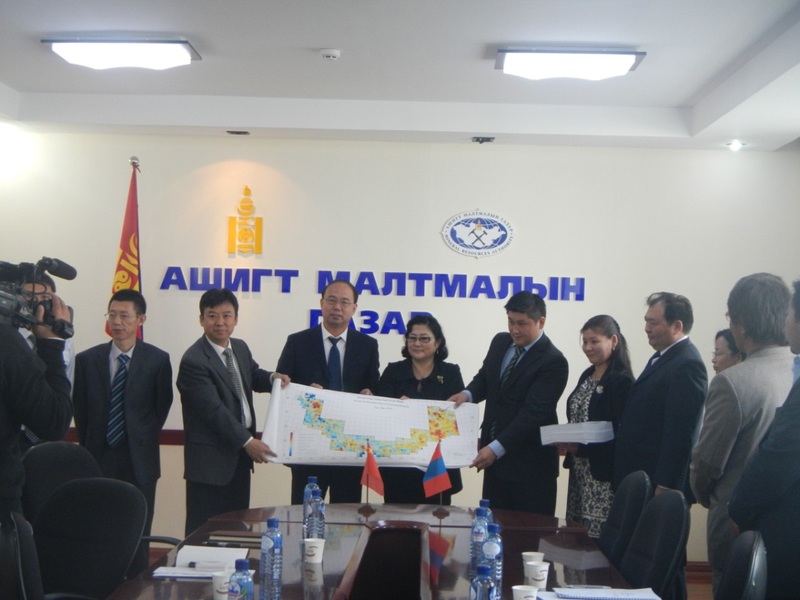 Geochemical Atlas of 69 elements were produced and provided to Mongolia (Fig. 2). The results shows that (i) regional geochemical patterns were firstly identified at the world’s largest REE ore deposit in China; (ii) regional patterns of Cu-Au-Mo have a good correlation with the porphyry metallogenic province in Mongolia. (iii) regional patterns of Ag-Pb-Zn have a good correlation with the polymetallic province. Four China scientists were awarded for the Mongolian Medal of Honour, which is the highest-ranking honour for geologists who have made a great contribution to Mongolian Geology and Mineral Resources. The China eastern agriculturally and industrially developed regions located in Quaternary plains were not mapped by the RGNR project. The China Geological Survey and provincial governments have jointly implemented multi-purpose geochemical survey projects since 2002 (Xie et al., 2008). The projects will provide geochemical data for environmental assessment, land use planning, agricultural production increase. Soils are taken as the general sampling media. Other media such as lake sediments, sea sediments, water and vegetables (crops) are collected in some regions for some specific purposes. Soil samples were collected from two layers: surface (0-20cm) and deep (150-200cm) horizon. The surface samples indicate anthropogenic influence and the deep samples indicate natural environments. The sampling density for the surface sample is 1sample/ km2 and for the deep sample is 1 sample/4km2. Four samples are composed into one analytical sample, i.e. one analytical top soil sample per 4km2 and one deep soil sample per 16km2. Samples were ground to -200 mesh for analysis. Fifty two parameters (Ag, Al, As, Au, B, Ba, Be, Bi, Br, C, Ca, Cd, Ce, Cl, Co, Cr, Cu, F, Fe, Ga, Ge, Hg, I, K, La, Li, Mg, Mn, Mo, N, Na, Nb, Ni, P, Pb, Rb, S, Sb, Sc, Se, Si, Sn, Sr, Th, Ti, Tl, U, V, W, Y, Zn, Zr), organic carbon(Org.C) and pH were determined. Approx. 1 million km2 has been covered up to 2011. A series of geochemical atlas have been published (China Geological Survey, 2010; 2011a; 2011b). The project is designed to carry out orientation geochemical survey at selected 10 large mines in China. Samples of tailings, stream sediments, soils, river water, underground water, and cones at each mining area are collected. The project began in 2011 and the results have not published. Exploration geochemistry research activities have centered on transport mechanism and development of methods for concealed deposits in covered terrains. Deep-penetrating geochemical methods such as selective leaching, geogas, electrical extraction have revealed that anomalies do exist at surface overlying mineral deposits covered by transported overburden. We do not yet fully understand the dispersion processes though many researchers recently have given different migration models. Recent years, a great progress on deep-penetrating geochemistry has been made in findings of evidences of nano-particles of metals over the covered ore deposits. Nano-particles of metals were observed in gases, soils and ore rocks at the copper-nickle , 'gold, copper-gold-silver deposits using a transmission electron microscope (TEM) equipped with an energy dispersive spectroscope (Wang and Ye, 2011; Wang et al., 2012, Ye et al., 2012). Particle diameters range from 10 to 200 nm. Most of them are generally tens of nanometers in diameters with ordered crystal structure observed by the TEM. The particles tend to assemblage shaped like a grape cluster. The particles are composed of native copper, compound metals of Cu-Fe, Cu-Fe-Mn，Cu-Ag，Cu-Cr，Cu-Ni, and compound metals with Si, Al, Ca, O, P from the copper-nickle deposit and Au, Cu-Au, Cu-Fe, Cu-Ti from the gold deposit. The facts of nanoscale particles with crystal structure (Fig. 3) show that nanoscale particles both in gases and soils originate from the ore deposit. The findings of nanoscale particles of mineralization metals provide direct observation evidence that the nano-particles of metals could penetrate through sedimentary, metamorphic and soil covers to the surface. A new method for separation of nanoscale particles from soils was developed to search for concealed deposits. 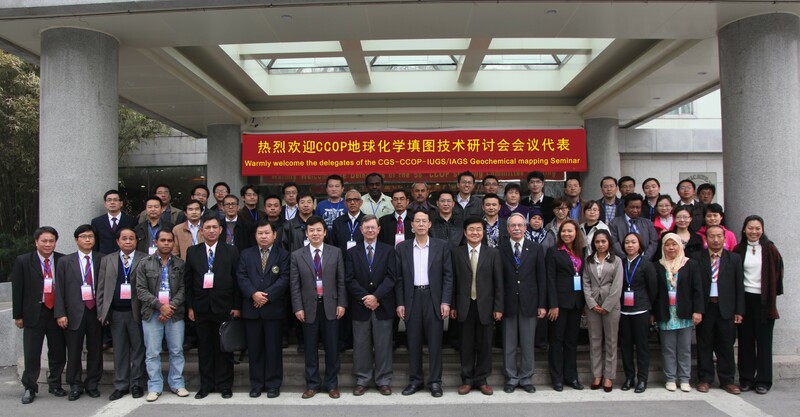 The 4rd China National Applied Geochemistry Symposium took place in Chengdu, China, November 26-28, 2012. The symposium was sponsored by the China Association of Applied Geochemistry and hosted by the Chendu University of Science and Technology. Approx. 350 participants attended the sympsium. Student paper prize was awarded for 10 students selected from 100 student participants in the sympsium. lContinental-scale Soil Geochemical Survey in North America. Geochemical data management and map generation. Implementation proposals for global-scale, national/regional-scale geochemical mapping in African countries were discussed in the training course. Professor Wang Xueqiu, Dr. Zhou Guohua and Mr. Zhang Qin from the Institute of Geophysical and Geochemical Exploration (IGGE), Dr. Liu Dawen and Dr. Xiang Yunchuan from the Develpment and Resaecrh center of the China Geological Survey gave the above-mentioned lectures. Field sampling trip to Beijing suberb focused on stream sediments and overbank sediments sampling in mountainous terrains, and soil sampling in plain terrains. Field sampling trip to Inner Mongolia focused on grassland sampling. A training course on Geochemical Mapping for Asian Countries are taking place in Beijing from October 22 to November 20, 2012. 46 participants from 12 countries (Armenia, Cambodia, East Timor, Kazakhstan, Kyrgystan, Malasia, Mongolia, Pakistan, Tajikistan, Thailand, Vietnam) participated in the course. 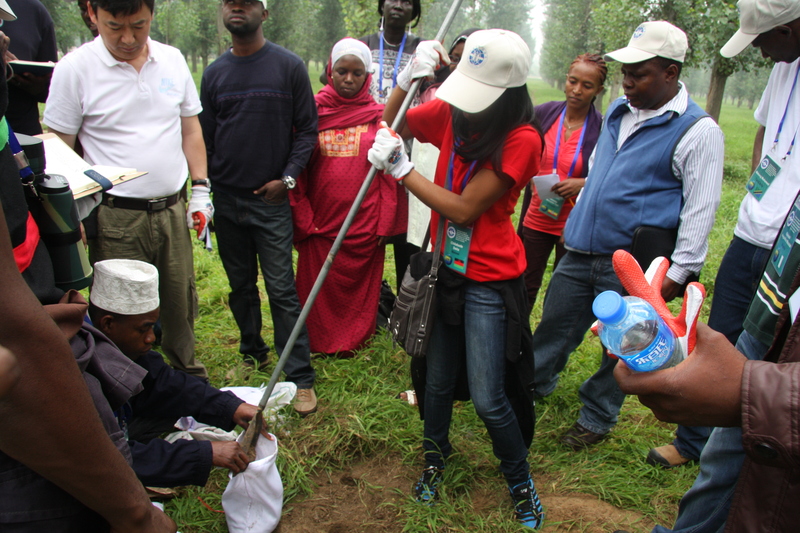 The lecture topics are the same as those of the Training Course on Geochemical Mapping and Environmental Geochemical Survey for African Countries. Alvarez Luis W, Alvarez Walter, Asaro Frank, Helen V. Michel. 1980. Extraterrestrial Cause for the Cretaceous-Tertiary Extinction. Science, New Series, 208(4448): 1095-1108. China Geological Survey, 2010. Multi-purpose Regional Geochemical Atlas: Poyang Lake and Its Surrounding Economic Zones, Jiangxi Province. Geological Publishing House, Beijing. China Geological Survey, 2011a. Multi-purpose Regional Geochemical Atlas: Yangtz and Huaihe River Catchments, Anhui Province, China. Geological Publishing House, Beijing. China Geological Survey, 2011b Multi-purpose Regional Geochemical Atlas: Hainan Island, China. Geological Publishing House, Beijing. Darnley, A.G., Bjoklund, A., Bolviken, B., Gustavsson, N., Koval, P.V., Plant, J.A., Steenfelt, A., Tauchid, M. and Xie Xuejing . 1995. A global geochemical database for environmental and resource management[R]. Final report of IGCP Project 259, Earth Sciences, 19. Paris: UNESCO Publishing, 1-122. Wang Xueqiu, 2012. Global Geochemical Baselines: understanding the past and predicting the future. Earth Science Frontiers, 19(3): 7-18. Wang Xueqiu, Ye Rong. 2011. Findings of Nanoscale Metal particles: evidence for deep-penetrating geochemistry. Acta Geoscience Sinica, 32(1): 7-12 (in Chinese with English abstract). Wang Xueqiu, Chi Qinghua, Liu Hongyan, Nie Lanshi and Zhang Bimin, 2007. Wide-spaced sampling for delineation of geochemical provinces in desert terrains, northwestern China. Geochemistry: Exploration, Environment, Analysis, 7: 153-161. Wang Xueqiu, Zhang Bimin, Liu Xuemin. 2012. Nanogeochemistry: Deep-penetrating geochemical exploration through cover. Earth Science Frontiers, 2012, 19(3): 101-112 (in Chinese with English abstract). Xie Xuejing. and Cheng Hangxin. 2001. Global geochemical mapping and its implementation in the Asia-Pacific region. Applied Geochemistry, 16, 1309-1321. Xie Xuejing, Mu Xuzhan and Ren Tianxiang. 1997. Geochemical mapping in China. J. Geochem. Explor., 60, 99-113. Xuejing Xie, Xueqiu Wang, Qin Zhang, Guohua Zhou, Hangxin Cheng, Dawen Liu, Zhizhong Cheng and Shanfa Xu. 2008. Multi-scale Geochemical Mapping in China. Geochemistry: Exploration, Environment, Analysis, Vol.8, pp. 1-9. Ye Rong, Zhang Bimin, Yao Wenssheng, Wang Yong. 2012. 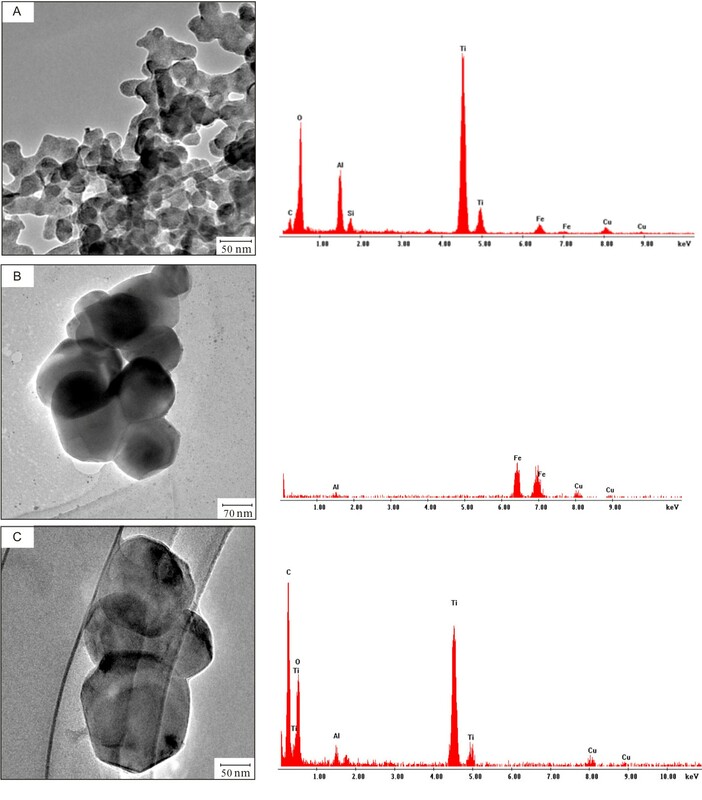 Occurrences and formation of copper nanoparticles over the concealed ore deposits. Earth Science Frontiers, 2012, 19(3): 120-129 (in Chinese with English abstract). In China research and exploration activities has centred on the following large projects, China Geochemical Baselines, Multi-purpose Geochemical Mapping, Geochemical Exploration and Assessment for Mineral Resources in Remote Landscape Terrains of China, Geochemical Mapping across the Boundary Regions of China and Mongolia. China Geochemical Baselines Networks Project (CGBP) was launched in 2008 and a 5-year term from 2008 to 2012 was designed for covering the whole China mainland. The project is to provide China nationwide geochemical baseline data, spatial distribution and evolution of all elements, and finally to establish a holistic “China Digital Element Earth”. Approximately 1500 CGB grids cover the whole China mainland (9.6 millions km2). Each CGB grid is approximately equal to a quarter of one Global Reference Network (GRN) grid. Total 6 000 soil (overbank/floodplain) samples and 10 000 typical rock samples will be collected in the whole China. Nearly all elements except gases in the periodic table will be determined. Half of China land has been covered in the past two years. It is expected to publish the whole data and atlas in 2013. Prof. Xie Xuejing is the Steering committee Chairman, Professor Xueqiu Wang is the project leader. The RGNR’ project, which has bee carried out 32 years, mainly covered hilly and mountainous regions. The eastern China with urban and developed agricultural regions was not covered by the project. Thus a new project named Multi-purpose Geochemical Mapping project focusing on environmental quality assessment, land use planning and geochemical hazards was jointly initiated since 2002 under the China Geological Survey and provincial governments. Soils are taken as the key sampling media. Lake sediment, water and vegetables (crops) are collected in some regions. 52 elements and organic carbon and pH were determined. It is expected to cover most of the Quaternary plain land of China in ten years. An area of 1.5 millions km2 has been covered till 2009. The project is to develop geochemical knowledge and methods for remote landscape regions, which are under-explored terrains, such as arid desert terrains, Forestry and grass land and tundra. China is cooperating with Mongolia in geochemical mapping at Scale of 1:1Million covering an area of approximately one million sq km across two countries. The project was launched in 2008 under the agreement issued by the China Geological Survey and Mineral Resources and Petroleum Authority of Mongolia. The Institute of Geophysical and Geochemical Exploration will offer help with sampling training and free chemical analysis for the samples from Mongolia. An area of 500 000 km2 have been covered with one sample per 100km2 till September, 2010. 54 elements are determined for each sample. It is expected to publish the geochemical atlas in 2011. The 3rd China National Applied Geochemistry Symposium will take place in Guangzhou, southern China, December 2010.